The rich Maryland tradition of thoroughbred racing is making a comeback according to Tom Mulikin at Sagamore and Mike & Josh Pons at Merry Land. While most Maryland farmers consider soybeans fodder for the animals, farmers Jerry Davidson, Jim Miller and Donald Marring have taken advantage of the increase in human consumption of the beans. Also, Joanne tries a traditional Japanese soybean dish at Joss Sushi in Annapolis. Modern technology allows farmers like Kenton Bender and Randy & Taylor Swann to continue their harvesting work even after nightfall. Then & Now: Maryland's great guano rush. Local Buy: Al Spoler talks spinach at Waverly Market in Baltimore. This is a tool for securing corn stalk bundles. Back in the days of hand-picking corn, farmers would often tie multiple corn stalks together to dry out for use as livestock feed later in the year. These corn bundles, better known as "corn shocks," were secured with rope or twine. 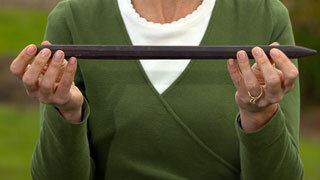 Corn shock ties, such as the one pictured, were used to ensure the bindings were sufficiently tight. The rope securing the bundle was wrapped around the tie, which was then twisted until the rope was taut. Today, corn shocks are mostly used as decorations – placed outside of storefronts alongside pumpkins and gourds as symbols of Fall. Pre-heat oven to 375°F. 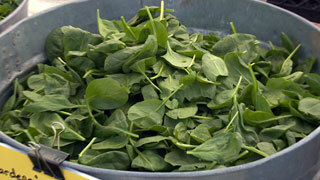 Take baby spinach and wash well in cold water. Place in a bowl. Crumble goat cheese into small pieces and set aside. *Recommend using 2 ounces of goat cheese per person. Dust pecans with powder sugar and bake for 10 minutes. Cool to room temperature. *Recommend using 1 ounce of pecans per person. Take peppers, cut in half and deseed. Rub with olive oil and roast for 20 minutes. Place peppers in paper bag and close for 10 minutes. This will help the skin peel off easily and release the flavors of the peppers. Cut peppers into strips and set aside. Take basil and remove stems. Cut them into strips and set aside. Wash blueberries well and set aside. For dressing combine all ingredients into a small bowl and whisk together with a fork. Combine all salad ingredients together. Toss with dressing. Enjoy! Natto, or fermented soy beans, is a traditional Japanese food, typically eaten for breakfast and highly valued for its perceived health benefits. You can try it for yourself at a number of area sushi restaurants, including Hinata Sushi Carry Out, Joss Sushi (ask in advance), Satsuma, and Yuzu Japanese Dining, or pick up a packaged version at various MOM's Organic Market locations throughout the state… or if you're feeling really adventurous – and have a lot of time on your hands – try making your own natto using the recipe below. Wash the soybeans and soak for 9 to 12 hours, longer during colder months. Use approximately 3 parts water to 1 part soybeans to allow for expansion. You will end up with 8 to 12 cups of beans. Drain beans and place in a large pot. Fill the pot with water and boil for 9 hours. Sterilize all materials (pots, utensils, containers, cheese cloth, etc.). Boil utensils for 5 minutes prior to using. Drain the cooked beans and place in sterilized pot. Dissolve 1 spoonful of Nattomoto powder into 2 teaspoons of sterilized water. Immediately pour natto spore solution over the beans while they are still warm. Stir the beans and natto spore mixture together carefully, using sterilized spoon. Place a thin layer of beans in each of the glass containers. If at any point beans spill onto the counter, discard the spilled beans – they could contaminate the entire batch. Place the sterilized cheesecloth over the top of the containers and place the tight-fitting lids over the cheesecloth. Preheat your oven, dehydrator, or KOTATSU Japanese Warmer to 100°F. Place the covered containers in the oven, dehydrator, or warmer and allow to ferment for 22 to 24 hours, being sure to keep the temperature at a steady 100°F. At the end of the fermentation period, let the natto cool for a couple of hours. Then remove the lid and cloth, replace the lid, and store the containers in the refrigerator overnight. 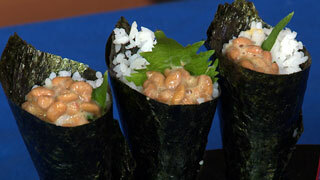 The natto can be consumed as early as the next morning, or aged in the refrigerator for 3-4 days. Serve with raw egg over rice. Flavor with soy sauce and mustard, or whatever other condiments you prefer. To pick up a bundle of delicious local spinach – or arugula or chard or beets – visit the Gardener's Gourmet booth at Waverly Market on 32nd Street in Baltimore.